Rohit Sharma, the Man of the Match in the first ODI against West Indies on Tuesday, rued the fact that he could not finish the match on his own. Punjab fast bowler Manpreet Gony wreaked havoc on the Railways batsmen as he grabbed four wickets to put his team in a commanding position on the second day of their Ranji Trophy match at the PCA Stadium here on Wednesday. The hockey tussle is set to flare up again as Hockey India has not taken kindly to the Sports Authority of India’s (SAI’s) decision to let out the Major Dhyan Chand (MDC) National Stadium to the Indian Hockey Federation-Nimbus combine to conduct the opening ceremony and some of the league match of the World Series Hockey, from December 17 to January 22. Though the Jaypee Group has invested over Rs 2000 crore to build and manage the Formula One track and stadium in Greater Noida and they have a 10-year agreement to run the F-1 races to recover the money, they may break earlier than expected as a number of events have been lined to make the place financially viable. A Force India car during the inaugural Indian GP in Greater Noida. Hockey India hardened its stand on the Indian Hockey Federation-backed World Series Hockey (WSH) as it elicited a written statement from six India players which stated, “we are not playing in the WSH event and that we will be attending the National camp in Delhi for the Olympic qualifiers on 11th December of 2011 until February 2012 and we will be available for selection in the National team for the Olympic qualifiers”. The signatories to the statement are Bharat Chetri, Tushar Khandker, Sreejesh, Sandeep Singh and Sardar Singh. Despite two convincing wins on the trot, India will have to guard against complacency when they take on an unpredictable Malaysia in the quarterfinal of the Champions Challenge hockey tournament here tomorrow. The B sample results of four more Indian kabaddi players, who were tested during the selection trials for the World Kabaddi Cup, have tested positive. NADA had collected the samples of all Indian players during the trials and as many as 20 failed in their tests as a result of which they were expelled from the camp with. Veteran Indian tennis player Mahesh Bhupathi claims it was Leander Paes' decision to end their much-hyped reunion within a year as he felt that they "were possibly a little too old on the tour and not able to gel on a consistent basis." "I guess everyone has their own opinion. Leander just felt that we were possibly a little too old on the tour and not able to gel on a consistent basis. He felt that our team needed fresh legs on either side. That was his point of view. Hockey India today announced an 18-member women’s team, to be led by Asunta Lakra, for the two four-nation tournaments in Argentina from December 7 to 18 in preparation for the Olympic qualifiers. Rohit Sharma, the Man of the Match in the first ODI against West Indies on Tuesday, rued the fact that he could not finish the match on his own. "The idea was to play through the innings, victory slipped out of their hands but West Indies skipper Darren Sammy lauded his boys for their never-say-die spirit with which they pushed world champions India in the first one-dayer, on Tuesday. In a thrilling low-scoring match India prevailed by one wicket with seven balls to spare while chasing 212 to win. "Everytime you lose it is quite disappointing. We just didn't have the last spark to take us past the finish line. The opening bowlers did well to give us a start and we fought all the way to the end, but it wasn't enough. We could have done things differently, we even bowled 23 extras, but I would like to commend the boys. They fought with never-say-die spirit and it is going to stick," Sammy said at the post-match presentation ceremony. A relieved Indian captain, Virender Sehwag said, "I was sitting in the same place and not moving! It's good to win another nail-biter. Whatever you tell No. 10 or No. 11, they always do what they want to do. I just told them to play till the end and whatever happens is fine. Rohit and Jadeja batted really well in that partnership and we should have won it easily from there, but still good to end up winning. We hope to learn from our batting mistakes in the coming games." Rohit Sharma, who scored 72 under immense pressure, said he was satisfied that he could help the side win but disappointed that he could not finish it off. "The idea was to play through the innings, but unfortunately I wasn't able to finish it. But it doesn't matter now, we won the game," Sharma, who was Man-of-the-match, said. Sharma also acknowledged the contribution made by Jadeja with whom he shared a crucial 83-run partnership when India were looking down the barrel at 59 for five. Punjab fast bowler Manpreet Gony wreaked havoc on the Railways batsmen as he grabbed four wickets to put his team in a commanding position on the second day of their Ranji Trophy match at the PCA Stadium here on Wednesday. Gony finished the day with figures of four for 24 as Railways were left reeling at 89 for 5 at close on Day Two. 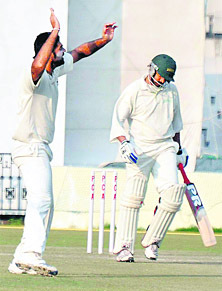 Earlier, skipper Uday Kaul smashed a superb hundred (131) as his team posted a challenging 366 in their first innings. Kaul slammed 17 boundaries before Krishnakant Upadhayay, who finished with seven for 76, ended the batsman's 403-minute stay at the crease. Much of Upadhayay's good work was, however, wasted as Manpreet Gony ran through the visitors' batting line-up, picking up four wickets. Coming on as first-change bowler, Gony bowled Shivakant Shukla to trigger the slide. Shreyas Khanolkar had no answer as he edged Gony to wicketkeeper Kaul. Top-scorer in the visiting side, V Cheluvaraj, who seemed to be fighting a lone battle, was dismissed by Harmeet Singh for 35, before Gony had the experienced Yere Goud and Mahesh Rawat trapped in front to leave Railways in a tight spot. At stumps, skipper Sanjay Bangar was unbeaten on 23, and giving him company was Jai Prakash Yadav, batting on eight. Earlier, resuming on 212 for three, Kaul, overnight on 82, was sensible in his approach as he guided his team to a competitive total after opting to bat. 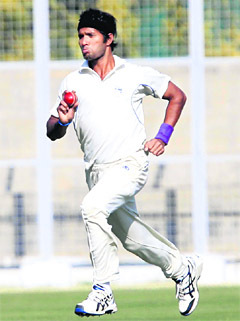 Brief Scores: Punjab 1st Innings: 366 (Uday Kaul 131, Mandeep Singh 73, Amitoze Singh 52; Krishnakant Upadhayay 7/76). Railways 1st Innings: 89 for 5 (V Cheluvaraj 35; Manpreet Goni 4/24). Hockey India secretary-general Narinder Batra, in a letter to SAI secretary Gopalkrishnan on November 28, had informed that the men’s coaching camp will start from December 11 and will go on till the Olympic qualifiers to be held at the MDC Stadium from February 15, 2012. Batra has asked the SAI to release Pitch 1 and 2 of the stadium for the men’s camp. Batra, in his letter, has also noted that the women’s camp will be held from December 27 till the Olympic qualifiers and Hockey India wants all the three artificial pitches for holding the men’s and women’s camps. Batra explained that besides the camps, two countries each in the men’s and women’s sections will be arriving in Delhi in early January, to play 12 Test matches with the hosts and the matches will go on till the end of January. Batra cautioned the SAI and the Sports Ministry that “in case the stadium is given to Nimbus to conduct their league at the cost of upsetting and spoiling the training schedule of the men’s and women’s teams, then there will be total mess and confusion at the stadium”. He felt that in such a crowded stadium, the programme fixed by the Chief Coach (Michael Nobbs) and the exercise physiologist for building of players to peak for the Olympic qualifiers will be nullified. Batra warned that the foreign teams for the Test series “may not come due to lack of security at the stadium and the FIH (International Hockey Federation) may instruct them not to go since an FIH-unsanctioned event is happening simultaneously at the venue”. Batra recalled that the Sports Ministry had given an assurance to FIH in September 2011 that it will not support any FIH-unsanctioned event and by this, it will be evident that the ministry is supporting the WSH at the cost of training and preparation of the National teams for the Olympic qualifiers. “This will have its natural repercussions at the FIH and also lower the prestige of the country,” Batra argued. He said the Sports Ministry’s legacy plan should have been to “encourage NSFs (National Sports Federations) to conduct international tournaments at the CWG (Commonwealth Games) venues but in this case, it seems a private business house is being encouraged at the cost of 12 Test matches by the NSF in January, which are integral part of the team-preparation for the Olympic qualifiers. “India has got a very good pool and an excellent chance of qualifying in the men’s section for the Olympics. Kindly do not allow that to get spoiled,” Batra added. HI has also pointed out that the huge rent of Rs 2.65 crore plus electricity to be charged for using the MDC Stadium for the Olympic qualifiers was far beyond its capacity to pay, as the rent in effect will work out to a whopping Rs 22 lakh per day. “The cost is abnormally way beyond our resources and we may have to look for an alternate venue and in case we do not get an alternate venue, then we will have to express regret to the FIH immediately so that they have sufficient time to relocate both the men’s and women’s Olympic qualifiers,” Batra noted. Sharma said, earlier, though the technology was available in India to develop more advanced machines, there was no proper infrastructure to try them out. “The F-1 track has filled that vacuum. Now the infrastructure is in place, our economy is stable and the future of motor sports looks rosier as all the issues will now get addressed,” Sharma noted. He said the future generation of racing enthusiasts will be equipped to face the challenge, unlike Narain Karthikeyan, Karun Chandhok and Arman Ebrahim, as “none of them were trained like their counterparts from the rest of the world”. Sharma said the racing activities will get more tech-savvy as already two-stroke karting is running into the third year and better technology and better cars will be available for the emerging racing champions. “Now things will happen the way it should have been, to give a big boost to motor sports in India, to make it at par with world standard,” Sharma elaborated. He said there were many racing programmes running already, like the JK Tyre Karting and the JK Tyre academies at Chennai and Coimbatore. The karts used for the races are like the ones used globally, which can get into a cruise mode of 162 plus km, unlike the four-stroke karts, which can only attains speeds of 42-100 km. Sharma said he could look ahead at the motor sports scene with a lot of optimism as there were 40-45 kids in the JK Tyre Academy who are taking their careers very seriously with the full backing of their parents and sponsors. Kids in the 8-10 age-group are taken at the first level and 14-plus are taken at the second entry level. There are many events like formula cars powered by 800cc engine at the entry level and other events like the National Championship, Formula Car 1300cc, Tin Top Cars (normal cars), 1600cc, Manufacturers Cup, Polo Cup, Volkswagen Cup etc. “As more events come up, we will up the technology now that there is a proper place to race in North India,” Sharma said. He said the Noida facility does not have to depend on races alone to generate revenue, as it can also be let out to hold events such as concerts etc. But he admitted that the pricing of the stadium was not savvy for sports-lovers though he hoped that it would get better in the coming years. Hockey India hardened its stand on the Indian Hockey Federation-backed World Series Hockey (WSH) as it elicited a written statement from six India players which stated, “we are not playing in the WSH event and that we will be attending the National camp in Delhi for the Olympic qualifiers on 11th December of 2011 until February 2012 and we will be available for selection in the National team for the Olympic qualifiers”. The signatories to the statement are Bharat Chetri, Tushar Khandker, Sreejesh, Sandeep Singh and Sardar Singh. These players said in their statement to Hockey India secretary-general Narinder Batra that “we signed the contract with the World Series Hockey under the impression that WSH will not force us to only play in WSH and ask us to leave the National camp. We appeal to WSH to postpone their tournament to after the qualifiers in the national interest. “We will play for our country and it is a matter of honour and pride for us,” they added. 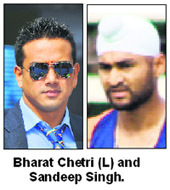 Sardar had been named captain of the Punjab team while former captain Rajpal Singh figures in the Delhi Wizards team. WSH announced here today that the Delhi team will be captained by Lucas Vila of Argentina and coached by Dutch legend Roelant Oltmans. The team: Mrinal Choubey and Kamaldeep Singh, C.S. Khalko, Jaswinder Singh, Keisham Roshan, Lovedeep Singh, Manjeet Kullu, Rupinder Pal Singh, Lucas Villa (Argentina), Bruno Lugun, Victo Singh, Manoj Antil, Rajpal Singh, Shakeel Abbasi (Pakistan), Anand Tirkey, Gurbaj Singh, Martijin de Jager (the Netherlands), Matiaz Minz, Patrick Harris (New Zealand), Vikram Kanth and Vivek Gupta. India topped Pool A while Malaysia, despite finishing last in Pool B, advanced as the new format allows all eight competing nations a place in the knock-out rounds. Two big wins against hosts South Africa and Poland have boosted India's confidence, but Malaysia will be eager to salvage pride after a lacklustre show in the three group matches. India have enjoyed an edge over Malaysia in this year's encounters, but last year's Asian Games semi-final loss to the same rivals will always stay at the back of the players' mind. The current Indian team, including several young players graduating to the senior side, has been on a high since winning the inaugural Asian Champions Trophy in which Malaysia won the bronze medal. India have been focusing on their attacking formations, even while trying not to show too much of their playing tactics to teams like Canada, who feature in the same Olympic Qualifying event in February. India's Olympic Qualifier will be in New Delhi, where Canada, France and Egypt are expected to be their main rivals for one slot in the 2012 Olympic Games at London. Indian coach Michael Nobbs says the team's focus has been on fine-tuning the attacking structure with focus entirely on the Qualifiers. "Our concentration in the Champions Challenge has been on the attacking structure, and we'll continue to work on that," said Nobbs. National Anti-Doping Agency Director-General Rahul Bhatnagar said that with the declaration of these results, the total count of players whose B samples have tested positive had reached 14. He informed that all these players have been issued orders to appear before NADA’s Anti-Doping Disciplinary Panel. “After their A samples were found positive, we had asked them to get the B samples done,” Bhatnagar said. The names of players who failed the B test are Gursewak Singh (Nava Shahr), Surjit Singh (Ludhiana), Varinder Singh (Moga), Paramjeet Singh Thikriwala (Sangrur), Karamjeet Singh (Sangrur), Jagsir Singh Chohan (Bathinda), Gurdarshan Singh (Moga), Nirvair Singh (Muktsar), Sukhjit Singh (Kapurthala), Balbir Singh (Amritsar), Kirandeep Singh (Bathinda), Surender Kumar (Jind), Sandeep Singh and Jasdeep Singh (Kapurthala). Unfortunately, that's the crux of the equation today," Bhupathi said. Team: Yogita Bali and Savita (goalkeepers), Jaspreet Kaur, Preety Sunila Kiro, Th. Pinki Devi, P. Sushila Chanu, Asunta Lakra (captain), Kirandeep Kaur (vice-captain), Ritu Rani, M.N. Ponnamma, Deep Grace Ekka, Rosalin Dung Dung, Rani, Th. Anuradha Devi, Poonam, Vandana, M. Lily Chanu and Lilima Minz.